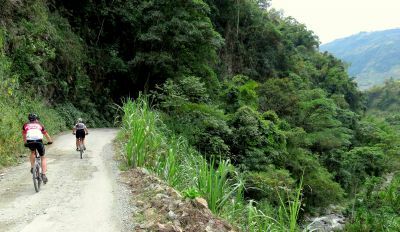 Our cycling holiday starts in Pereira on Sunday. The holiday ends in Medellin 14 days later, on a Saturday. If you decide to arrive early or stay on after the tour, redspokes can assist you in booking your accommodation and airport transfers at additional cost. Due to high demand for rooms there is a possibility you may be in a different hotel to the start / end hotel of your trip. If you are flying from the Europe, you should look to get a "multi-destination" flight that arrives into Pereira and leaves from Medellin. If flying from the UK, AA and Air France appear to be the favoured airlines by our customers. Check out www.kayak.com or www.opodo.co.uk for an idea of times and prices. Most of the food is provided on your 14 day tour (see trip notes for details) along with snacks and mineral water during cycling days. 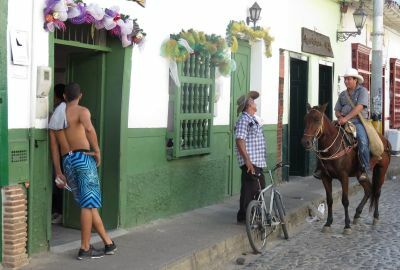 All transportation and local guides within Colombia are included. International flights are not included in the tour costs. Most of the food is included in the trip (see itinerary for details). The Colombian diet is meat based but we will cater for vegetarians. Breakfast is considered an important meal in Colombia and includes fruit juice, coffee or hot chocolate, fruit, eggs and bread. In rural areas Lunch (served between 12 and 4pm is typically the main meal of the day). A traditional Colombian main meal starts with a soup, followed by a main dish, a drink and sometimes a dessert which is generally very sweet. The evening meal is usually lighter. In the big cities the main meal often will be served around 7pm or 8pm. Traditional Colombian dishes include Ajiaco: Chicken soup as well as chicken this dish includes 2 or 3 kinds of potatoes, corn, sour cream, capers, avocado and guasca. Arepa: A basic side to any Colombian meal, arepa is a bread made from cornmeal. Bandeja Paisa: A mixed platter of grilled steak, fried pork rind, chorizo sausages, on a bed of rice and red beans, topped with a fried egg and a side of sliced avocado and sweet banana (chips). Arguably the national dish of Colombia. There is an abundance of fresh fruit on offer in Colombia.